The indicator lamp in the button comes on. We recommend the use of this mode: it permits automatic and optimised adjustment of all of the functions, passenger compartment temperature, air flow, air distribution and air recirculation, in accordance with the comfort value that you have chosen. To prevent too great a distribution of cold air when the engine is cold, the air flow will reach its optimum level gradually. In cold weather, it favours the distribution of warm air to the windscreen, side windows and footwells only. 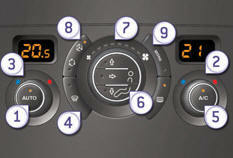 The driver and front passenger can each adjust the temperature to their requirements. The value indicated in the screen corresponds to a level of comfort and not to a temperature in degrees Celsius or Fahrenheit. Turn control 2 or 3 to the left or to the right respectively to decrease or increase this value. A setting around the value 21 provides optimum comfort. However, depending on your requirements, a setting between 18 and 24 is normal. You are advised to avoid a left / right setting difference of more than 3. On entering the vehicle, if the interior temperature is much colder or warmer than the comfort value, there is no need to change the value displayed in order to obtain the comfort required more quickly. The system corrects the difference in temperature automatically and as quickly as possible. The automatic comfort programme may not be sufficient to quickly demist or defrost the windscreen and side windows (humidity, several passengers, ice, etc.). In this case, select the automatic visibility programme. The system automatically controls the air conditioning, the air flow and the air intake and provides optimum distribution of the ventilation to the windscreen and side windows. To switch it off, press the "visibility" button again or press the "AUTO" button, the indicator lamp in the button goes off or the indicator lamp in the "AUTO" button comes on. If you wish, you can make a different choice from that offered by the system by changing a setting. The other functions will still be controlled automatically. Pressing the "AUTO" button returns the system to completely automatic operation. For maximum cooling or heating of the passenger compartment, it is possible to exceed the minimum value 14 or the maximum value 28. Turn control 2 or 3 to the left until "LO" (low) is displayed or to the right until "HI" (high) is displayed. Switching the system off could result in some discomfort (humidity, condensation). Press this button again to return to automatic operation of the air conditioning. The indicator lamp in the "A/C" button comes on. To obtain cool air more quickly, you can use interior air recirculation for a few moments. The return to the intake of exterior air. In winter, we recommend keeping the rear air vents closed. - the windscreen, the side windows and the footwells. Turn this control to the left to decrease the air flow or to the right to increase the air flow. The air flow indicator lamps, between the two fans, come on progressively in relation to the value requested. Press this button to recirculate the interior air. The indicator lamp for the button corresponding to the function chosen comes on. - Closed/Air intake (automatic mode). Press this button, the indicator lamp comes on. - Forced closing of air intake (manual mode). press this button to recirculate the interior air, the indicator lamp comes on. As soon as possible, press the "auto" button to allow the intake of exterior air and avoid misting. Press this button to equalise the comfort value on the passenger side with that on the driver's side (monozone). Turn the air flow control to the left until all of the indicator lamps go off. This action switches off all of the functions of the system. Temperature related comfort is no longer guaranteed but a slight flow of air, due to the movement of the vehicle, can still be felt. Turn the air flow dial to the right or press the "AUTO" button to reactivate the system with the values set before it was switched off. Avoid driving for prolonged periods with the system off.